While we work with party rentals every day, a lot of people will only need to attain party rentals once in their lives, perhaps for a wedding. This can leave a lot of questions about party rentals, what you need, and how to take care of them. 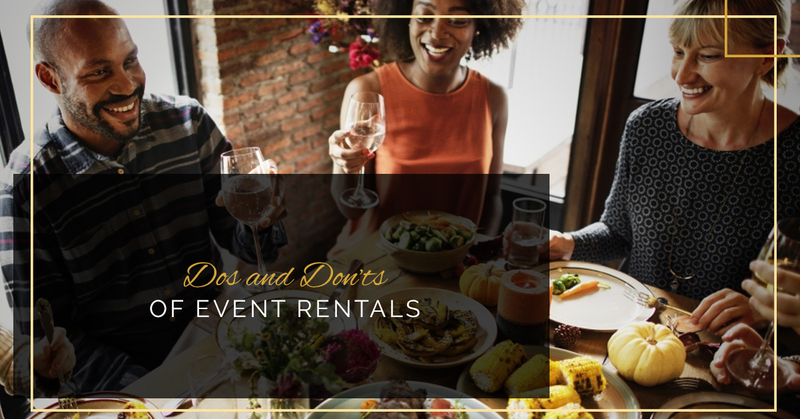 In today’s blog, we’re going over some basic dos and don’ts of party rentals to give you a better idea of this industry. Keep reading to learn more! We don’t mean to be a stick in the mud, but we do ask that you be respectful of your rentals and follow all of the rules. You never know who else is counting on that rental the next day, so ensuring it is returned in good condition is key to everyone being happy. As a bouncy castle vendor, we care that your children are equally as safe as they are excited about being in a bouncy castle. Be sure to assign a trustworthy adult to supervise kids and don’t let big kids jump with little kids, as this is the main cause of injury in bounce houses. If you are having an outdoor wedding or party, you just cannot predict the weather. Save yourself some stress and reserve a wedding tent rental just in case. You might even decide to use it regardless of the weather to give guests some shade! We will always try to work with you to get you the rentals you need when you need them. However, we aren’t magicians who can pull a pole tent out of a hat the day of a wedding. Make sure to book your rentals with plenty of time to spare! So, you invite 150 guests to your wedding, and only 100 people RSVP — that means you only need 100 chairs, right? Unfortunately, that’s not the case. Anyone who has planned a wedding knows that getting RSVPs back can be like pulling teeth. You also know that there’s always going to be someone who brings their four kids even though you only accounted for them and their spouse, as well as someone who brings an uninvited plus-one. There’s also going to be those people who swear they put their RSVP in the mail even though you know they’re lying. Be sure to rent the number of chairs as guests you invited just in case. Lucky for you, we are your one-stop-shop for party rentals in Fredericksburg. That means it shouldn’t be hard to remember to reserve your tablecloth and napkin rentals at the same time you get your chairs. But just in case, here’s a reminder! Tablecloth rentals are a relatively small price to pay for an event that looks beautiful and put-together. Of course, if you’re having a wedding you don’t really need to worry about entertaining the kids, as parents know that if they bring their kids to a wedding, they’re probably on their own for watching them. However, if you’re throwing a company picnic or a block party, it would be a nice gesture to include something for the kids to do. This can be a bounce house or inflatable obstacle course rental or something as simple as a craft table with coloring books. Alright, alright. It’s not all about the kids! Be sure to have plenty of activities to keep the adults busy too. This most likely means having a bar with free alcohol, but can also include lawn games, a great DJ, and tasty food. Dance floor rentals exist for a reason. Most people think there’s no need for this, especially if their guests aren’t going to be waltzing across the floor. However, the job of a dance floor is to protect the floors at your venue. If your venue finds that you left scuff marks all over the floor, you might be met with a hefty fine. But dance floors are durable and designed to withstand a night of dancing. Most people think of ‘party rentals’ as being limited to chairs, tables, and tents. But we have so much more than that! Our Fredericksburg event rentals company offers tabletop decor, candelabras, lattice displays that you can decorate with beautiful ivy and flower arrangements, and more! Whether you are having your event in a park, a parking lot, or some other public place, you will likely need to check with the city to see if you need permits, otherwise, you run the risk of getting shut down or getting fined. If you get in touch with us at least two weeks before you need your rental, we can often handle this step for you. You can get in touch with us for more information on this! If you have any questions about party and event rentals in Fredericksburg, don’t hesitate to give us a call! We’d love to get you set up with all of the rentals you need to make your block party, company picnic, or wedding the best ever!